Ever wondered what to do with a cast iron Dutch oven? 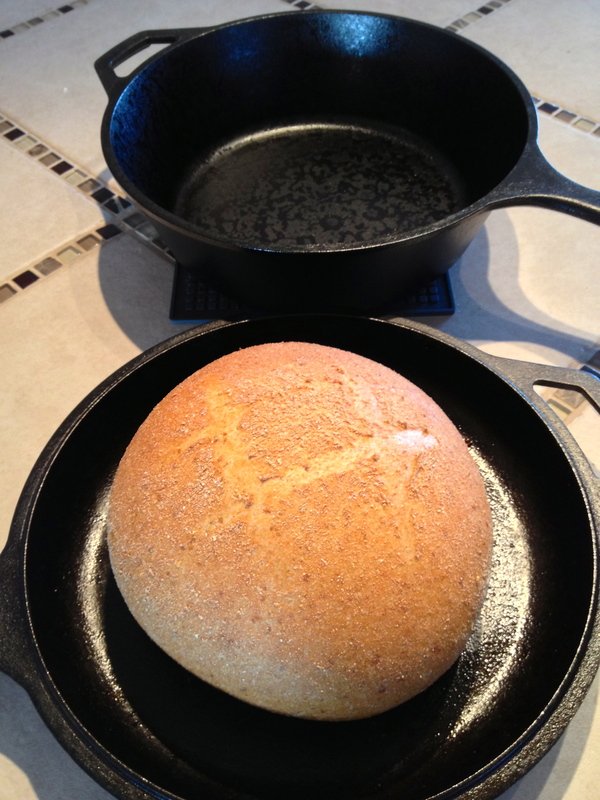 Or if your cast iron skillet could be used to make bread? 1 ½ cups warm water (minus 1 teaspoon). The dough will be tacky, but not too sticky. 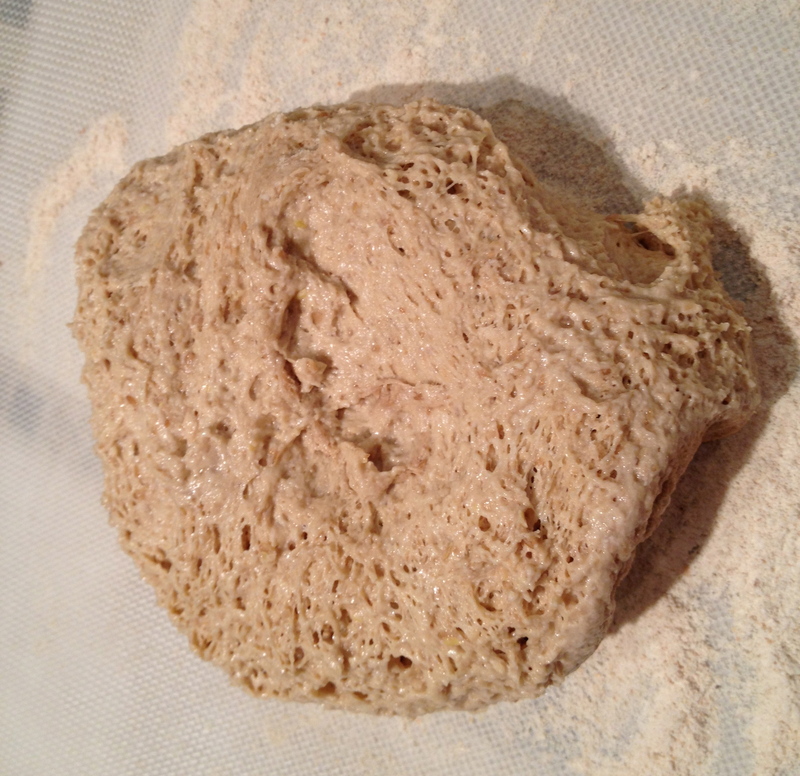 The dough will look slightly spongy. 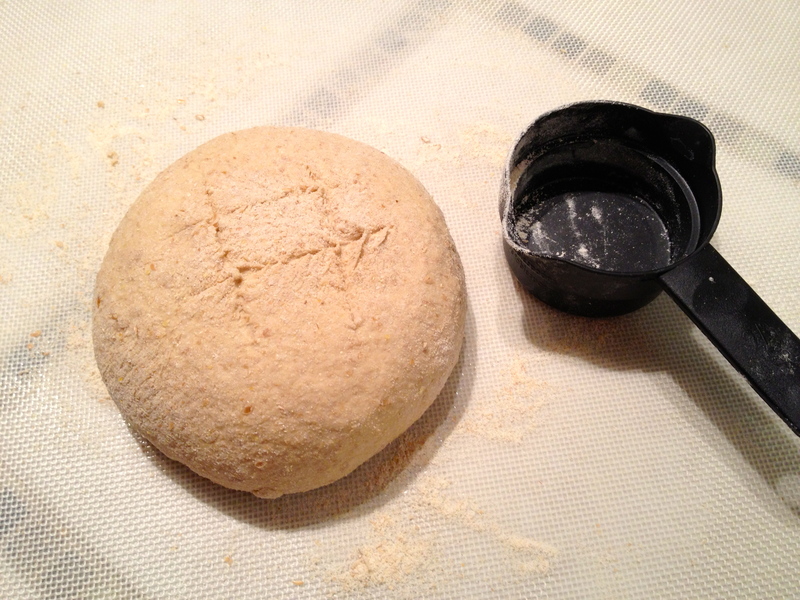 The ball of dough won’t be overly large (it’s next to a 2/3 measure cup). 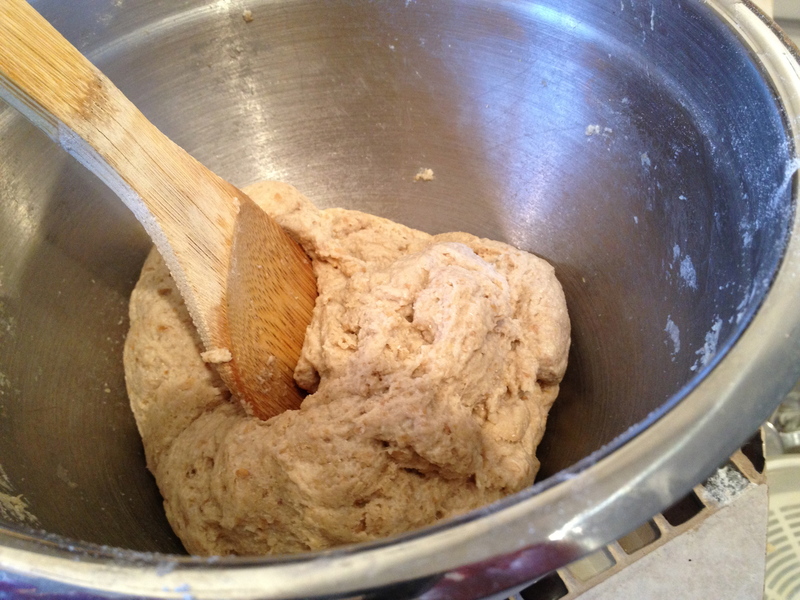 In a large mixing bowl, whisk together the flour, vital wheat gluten*, salt and yeast. Add the water and lemon juice and mix with a sturdy spoon until the dry ingredients have formed a ball of dough. Cover the bowl with plastic wrap and set aside for 12-18 hours (I like to mix it up at night and leave it in the oven with the oven light on—the oven light will keep the oven toasty warm and help the yeast to work its magic). After 12-18 hours, turn the oven to 450 degrees (if you left the bowl in there overnight, make sure you remove it before turning the oven on!) and place a cast iron pot with a lid in the oven and heat it for 40 minutes. While the oven/pot heat, turn the dough onto a heavily floured surface and knead it for about a minute, incorporating more flour into the dough if necessary. Form a ball and use a sharp knife to cut a hash tag on the surface. Use the bowl you mixed the dough in to set upside down over the dough while you wait for the oven/pot to heat. When the oven/pot are hot, remove the hot pot from the oven and set the ball of dough inside, replace the lid (or, if you don’t have a Dutch oven or cast iron pot with a lid, use tinfoil to cover the top of the pot). Bake for 30 minutes. At the end of 30 minutes, remove the lid (or the tinfoil), and bake for an additional 10 minutes. Cool on a rack and try to restrain yourself from ripping into the loaf while it’s too hot! The resulting loaf will weigh about a pound and a quarter. *Vital Wheat Gluten is the natural protein that you find in wheat, in a concentrated form (75% protein). The best places to buy it are stores that have bulk food aisles, health food stores or Andy’s Market (they’ll ship it). 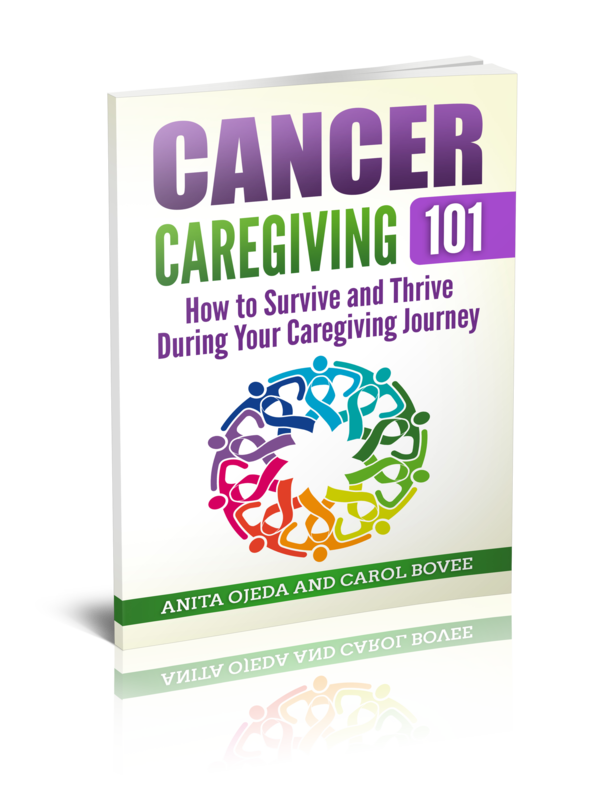 It’s available, but pricy in regular grocery stores. If you’d like to know more about why I develop these recipes, read my Healthy (er) Choices Manifesto.